Tigersharkdude loves Destiny. He’s also deaf. As a result, he asked the “DestinyTheGame” subreddit to help him petition Bungie to make the game’s subtitle options more robust. TR: What inspired you to make your post on the Destiny subreddit? 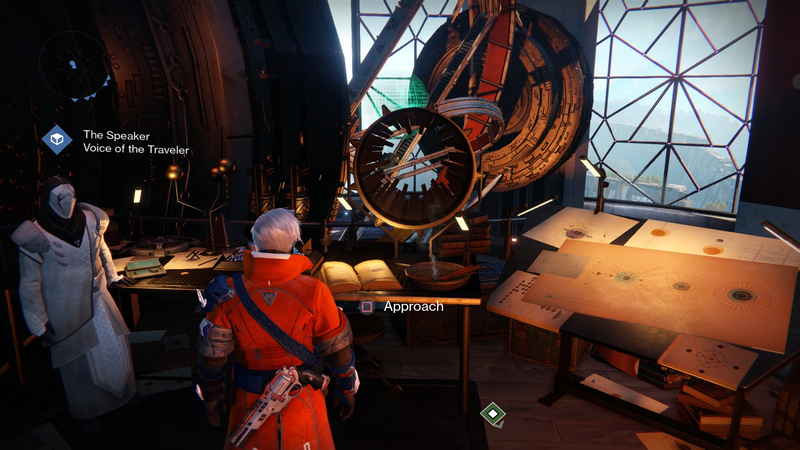 TR: Aside from the NPC dialogue, how accessible is Destiny for the hearing-impaired? On paper, Destiny’s story sounds barren, and in practice it’s short-lived and utterly nonsensical. According to sources close to the game’s development, this is partly due to last minute changes that completely up-ended what the game’s main campaign was supposed to look like. And plenty of people felt that The Taken King expansion helped plaster over some of the cracks in the base game. In truth though, to the extent that Destiny has any semblance of a meaningful narrative, it’s one that plays out in the game’s more mundane, less showcased moments. The story behind a particular gun, for instance, or some cryptic lore on the back of a newly collected Grimoire card. The game is built in large part on a series of repetitions, less grand sci-fi epic than a day in the life of a space person. Complete some bounties here, de-crypt some engrams there, and maybe even spit into the wind a few times as you curse that guy who just ditched your Weekly Strike mission half-way through. So I can imagine how frustrating it would be to miss out on all of the game’s smaller dialogue, whether it’s being barked at by Shaxx while getting decimated in the Crucible or hearing Destiny’s ethereal NPCs ramble on about this or that as you run by them in the Tower. The game has an option for subtitles, but it doesn’t cover the full gamut of everything that’s spoken aloud in the game. Which is a lot. Turn the sound off after having put hundreds of hours into Destiny, and you’ll realize just how much more hollow the game feels without the constant jabs and quips of its NPCs. Games like The Witcher 3, while not perfect in this regard, certainly do a better job of making the game’s litany of unique lines readable. They shared their data publicly on The Last Door forums: 12.33 percent of players turned on closed captions and 13.78 percent used the dyslexia font. “Does that mean that 12% of the players were deaf and 13% were dyslexic?” Mairena says. “No. Many deaf and dyslexic players thanked us a lot on forums [for] those options, but the reality is that [the] options were also used by other people for various reasons. They were people that played without speakers or headphones, for example, or who were stuck in some puzzles and the closed captions helped them.” Some may have simply disliked the pixelated standard font. Accessibility features don’t just benefit disabled people. “You are also making a better product in which people can feel more comfortable because it has a better design and [more] options,” he explains. Or as Hamilton says, “Something that’s a showstopping barrier for someone with an impairment is often still an annoyance for everyone else, so even basic things like offering a choice of controls or backing up color with iconography are just good general game design practice.” And in the long run we’ll probably all need to fall back on at least one such feature. “The average age of players is increasing,” Mairena says. You can find a video showing exactly what the problem is with Destiny’s subtitles here. You can also learn more about gaming with disabilities at the Able Gamers Charity.